6:09pm and I’ve just started writing this blog post! Because the reality is that if you’re studying full time whilst running a business, you’re going to have to be flexible with deadlines and your work hours. It’s just hit daylight savings here in Melbourne which means - yes MORE LIGHT! Which I am all about because who doesn’t love sunnier evenings. I’ve just got back from filming videos with Erin and Ruby (two of my business besties) and we had a super high vibe mastermind! 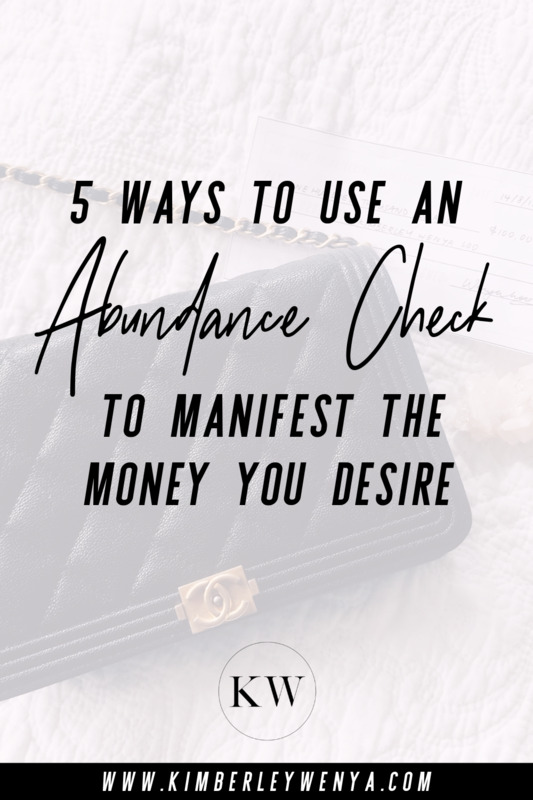 Today’s blog is all about 5 was to use an abundance cheque to manifest - you got it - abundance! So if you girls are familiar with my blogs, you know that we’re super chill here. Also to the point, with specific tips and details. SO, if you’re wanting to manifest money, writing your own abundant cheques is SUCH a high vibe way to do so. It’s also super cute and aesthetic! Just like in the photo above, the aim is to write your money goal on a cheque as a tool to help you manifest it! So I don’t remember exactly where I heard this, (maybe it’s Feng Shui) but the left-most corner of you house is the “abundance” corner! So I love to put a citrine crystal with my abundance deck tucked into this corner as it ensures that abundance is on your way! I love to place a cheque in my bag. It makes me feel abundant wherever I go, and I spend it during the day mentally on things that I would like! This helps you feel abundant because you’re easily “purchasing” things that you desire without telling yourself “I can’t afford that” - which is a thought you want to get rid of! Now this is something that you can probably do with your other modern girl manifestation friends - girls who are into the woo, but I love giving away abundance cheques to others! You can fill it in for them and give it to them, or give them a blank cheque to write how much they’d love to manifest! When you help others feel abundant, it helps you also feel abundant! Literally paste one cheque that you’ve written out into your journal - and then let yourself forget about it! I did this in the month of August (27th to be exact) and as I went to reflect again at the end of September, I hadn’t pasted it so it FELL OUT. And when I checked the amount that was on it, it was the EXACT amount I had manifested in the month of September!! As you have your cheque, pick it up intentionally every now and then and use it as a tool to feel into the abundance! Doing this honours the law that feelings is the gas of creating things in this world. When you feel something, you create experiences in your life that vibrationally align with that! Feel into the abundance, and you will bring abundance into your life through any spiritually aligned action that comes up! SO babes I’m so excited for you to try out these abundant cheque rituals! If you would love a super chic and minimalist cheque (the exact one I used to manifest my financial goal in September), my Manifestation Monthly babes get this beautiful print out cheque! Girls have used it to manifest amounts of money! Stevi manifested over $4k using her cheque! Not only that, October’s masterclass was ALL about money manifestation 101! When you come and join the beautiful membership site, you get access to all past trainings PLUS if you join at the moment you will get access to 3 additional bonus masterclasses!! The doors are open for a limited amount of time, so definitely come join your girl tribe here! See you in the tribe!